Ghanaian international artiste, base in UK, Reggie Zippy has been involved in a motor accident. The accident occurred on Friday morning, February 1, 2019, while he was on his way to drop his son in school. The "Adoma" hit-maker who survived the accident unhurt with his son, shared his unfortunate experience on social media. 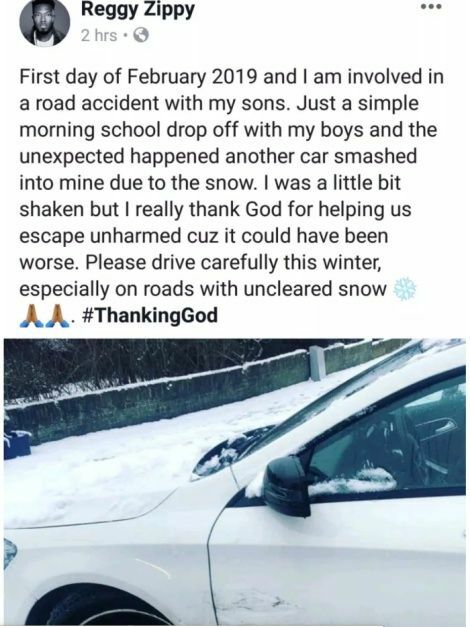 According to him, he was driving his son to school when a car ran into his car due to the snow. He noted that as a result of the motor accident, he got a bit stunned but he thanked God for saving their lives. 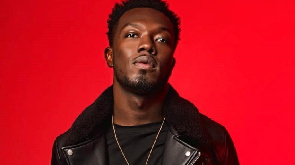 Reggie is one half of UK based Reggie 'n' Bollie (formerly Menn on Point). Reggie N Bollie are a Ghanaian music duo consisting of Reggie Zippy and Bollie Baby-face. They formed in 2012 and are best known for finishing as runners-up on the twelfth series of The X Factor UK in 2015.